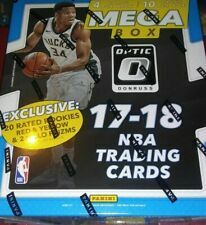 Click Image Above to find Cheapest Hobby Boxes of Optic on Ebay! 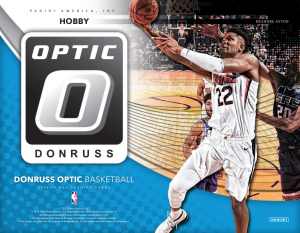 2018-19 Donruss Optic Basketball Features on Card Signatures of someof the top draft picks from the 2018 NBA Draft Class including: LUKA DONCIC – DEANDRE AYTON – MARVIN BAGLEY – JAREN JACKSON – TRAE YOUNG – SHAI GILGEOUS-ALEXANDER – COLIN SEXTON – KEVIN KNOX AND MORE! 2016-17 Ben Simmons Upper Deck Exquisite Rookie Auto BGS #43/99 BGS 9.5/10 GEM!! luka doncic prizm silver FAST BREAK DISCO !! Sensational Signatures !! Christian LaettnerDewayne DedmonDominique WilkinsJeremy LinJohn CollinsKevin HuerterOmari SpellmanPete MaravichSpud WebbTaurean PrinceTrae YoungLenny WilkensAl HorfordDennis JohnsonGordon HaywardJaylen BrownJayson TatumKyrie IrvingLarry BirdNate ArchibaldPaul PierceRobert ParishRobert Williams IIISam JonesTom HeinsohnD'Angelo RussellDeMarre CarrollDzanan MusaJarrett AllenRodions KurucsRondae Hollis-JeffersonSpencer DinwiddieAlonzo MourningBaron DavisBismack BiyomboDevonte' GrahamJ.P. MacuraKemba WalkerMalik MonkMarcus PaigeMichael Kidd-GilchristMiles BridgesNicolas BatumTony ParkerAntonio BlakeneyChandler HutchisonDennis RodmanDenzel ValentineKris DunnLauri MarkkanenRobin LopezScottie PippenSteve KerrWendell Carter Jr.Zach LaVineBilly PrestonCollin SextonGeorge HillJR SmithKevin LoveKyle KorverLarry Nance Jr.LeBron JamesRodney HoodTristan ThompsonDaryl MaconDeAndre JordanDennis Smith Jr.Dirk NowitzkiHarrison BarnesJalen BrunsonKostas AntetokounmpoLuka DoncicWesley MatthewsDan IsselDavid ThompsonDikembe MutomboGary HarrisJamal MurrayJarred VanderbiltMichael Porter Jr.Nikola JokicPaul MillsapTrey LylesWill BartonAdrian DantleyAndre DrummondBlake GriffinBob LanierBruce BrownDennis RodmanGrant HillKhyri ThomasLuke KennardReggie JacksonStanley JohnsonDeMarcus CousinsDraymond GreenJacob Evans IIIKevin DurantKlay ThompsonStephen CurryBrandon KnightCalvin MurphyCarmelo AnthonyChris PaulClint CapelaClyde DrexlerElvin HayesEric GordonGerald GreenJames HardenMarquese ChrissMichael Carter-WilliamsRalph SampsonTracy McGradyVincent EdwardsAaron HolidayAlize JohnsonBojan BogdanovicEdmond SumnerGeorge McGinnisMyles TurnerReggie MillerThaddeus YoungTyreke EvansVictor OladipoAvery BradleyJerome RobinsonLou WilliamsMarcin GortatPatrick BeverleyShai Gilgeous-AlexanderTobias HarrisTyrone WallaceBob McAdooBrandon IngramIsaac BongaJamaal WilkesKentavious Caldwell-PopeKobe BryantKyle KuzmaLeBron JamesLonzo BallMagic JohnsonMoritz WagnerNick Van ExelRajon RondoShaquille O'NealSvi MykhailiukTyson ChandlerWilt ChamberlainDillon BrooksJaMychal GreenJaren Jackson Jr.Jevon CarterMarc GasolMarShon BrooksMike ConleyAlonzo MourningDion WaitersDwyane WadeGoran DragicHassan WhitesideJames JohnsonRay AllenYante MatenBrook LopezDonte DiVincenzoEric BledsoeGiannis AntetokounmpoKhris MiddletonMalcolm BrogdonMatthew DellavedovaOscar RobertsonRay AllenThon MakerTony SnellAndrew WigginsDario SaricDerrick RoseJeff TeagueJosh OkogieKarl-Anthony TownsKeita Bates-DiopKevin GarnettAnthony DavisElfrid PaytonIan ClarkJrue HolidayJulius RandleNikola MiroticTrevon BluiettAllonzo TrierEnes KanterFrank NtilikinaKadeem AllenKevin KnoxKristaps PorzingisLuke KornetMario HezonjaMitchell RobinsonTim Hardaway Jr.Willis ReedDennis SchroderGary PaytonHamidou DialloNerlens NoelPaul GeorgeRussell WestbrookShawn KempSteven AdamsAaron GordonAnfernee HardawayD.J. AugustinEvan FournierJarell MartinJustin JacksonMelvin Frazier Jr.Mo BambaNikola VucevicTerrence RossAllen IversonBen SimmonsCharles BarkleyFurkan KorkmazJimmy ButlerJJ RedickJoel EmbiidJulius ErvingLandry ShametManute BolMarkelle FultzZhaire SmithAmar'e StoudemireDeandre AytonDe'Anthony MeltonDevin BookerDragan BenderElie OkoboGail GoodrichJosh JacksonMikal BridgesRyan AndersonStephon MarburySteve NashT.J. WarrenTrevor ArizaAnfernee SimonsBill WaltonCJ McCollumDamian LillardDrazen PetrovicEvan TurnerGary Trent Jr.Jusuf NurkicWade Baldwin IVZach CollinsBogdan BogdanovicBuddy HieldDe'Aaron FoxMarvin Bagley IIIWillie Cauley-SteinZach RandolphArtis GilmoreBryn ForbesChimezie MetuDavid RobinsonDeMar DeRozanDennis RodmanGeorge GervinLaMarcus AldridgeLonnie Walker IVLouie DampierPau GasolRudy GayTim DuncanDanny GreenDeMar DeRozanJonas ValanciunasKawhi LeonardKyle LowryLorenzo BrownOG AnunobySerge IbakaTracy McGradyDerrick FavorsDonovan MitchellGrayson AllenJairus LylesJoe InglesJohn StocktonKarl MaloneRicky RubioRudy GobertTyler CavanaughBradley BealDwight HowardJeff GreenJohn WallOtto Porter Jr.Troy Brown Jr.